Fossil cats can be grouped in two major classes based on the geometry of their upper fangs. The normal sized tooth cats have canines with round a cross-section and they are called CONICAL-TOOTHED cats. The saber-toothed cats are in a separate class and they also can be grouped in two further classes known as SCIMITAR-TOOTHED cats and DIRK-TOOTHED cats. The Scimitar-toothed cats have coarsely serrated fangs that are shorter and broader than the Dirk-toothed cats. Examples of Scimitar-toothed cats include Nimravides, Machairodus Xenosmilus and Dinobastis. The Dirk-toothed cats have fangs that are much longer and narrower and may or may not have serrations. Examples of Dirk-toothed cats include Megantereon and Smilodon. The origin of Sabre-toothed cats is unknown but generally speaking, felids migrated to North America around 16 million years ago during the Miocene Period. In the European Lower Pleistocene, the panther-sized Megantereon was the dominant saber-toothed cat in the Mediterranean region from Africa to Asia. 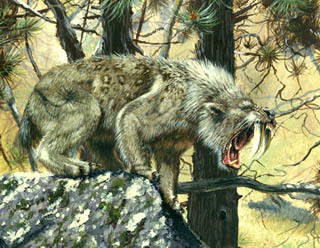 This species possibly reached North America via the Bering land bridge to later evolve into the large and powerful Smilodon. This massive saber cat weighed 600 to 800 pounds and measured 39 - 47 inches high! By the Upper Pleistocene, the largest of the Sabre-toothed cats, Smilodon, had appeared in North America. The last of the great predators (Smilodon and Dinobastis) succumbed to extinction in North America approximately 11,000 years ago.